Summers are dry here. Nor’west winds whip hot and dry across the plains, sucking moisture from the plants and soil. Though I protect my garden as best I can, with mulch and shelter, there is no escaping the need to water, at least once in a while. That’s in a good year, when it rains occasionally during the summer. Last year, we got almost no rain from October to February, and our autumn and winter have been unusually dry as well. The prediction with climate change is for more of our years to be like that. Which naturally leads me to worry about water. For now, there is plenty of water in our well to keep the vegetable garden green in a dry year. But if we have more and more dry years, who knows what might happen to the water table. So this year, when we needed to address some aging guttering on our sheds anyway, we tried to arrange things so we could make better use of the rain that does fall on the property. We had a rain barrel before—a rusty old 55 gallon drum of unknown origin, from which we were able to draw rust-flecked orange water in an emergency. It was great for flushing the toilet after the earthquakes, but it wasn’t particularly pleasant, and it wasn’t enough water to make much difference if we needed to use it on the garden. 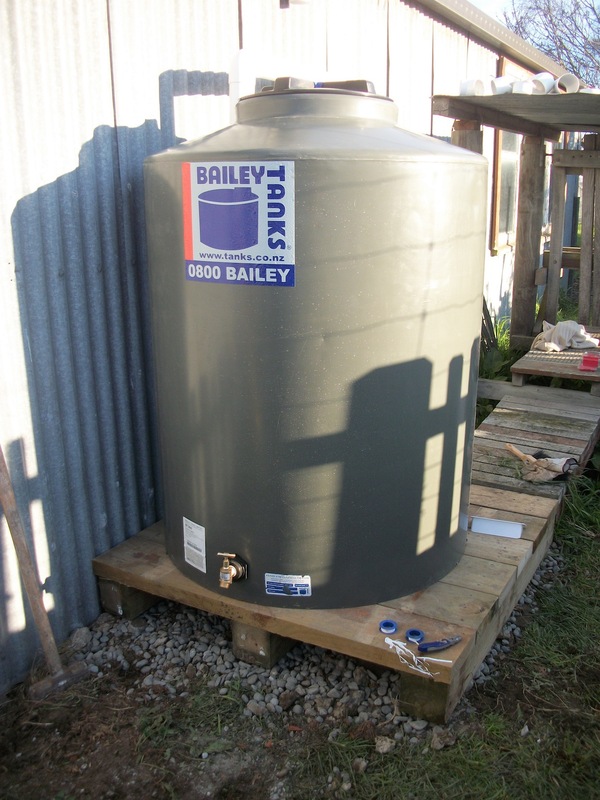 Now we have a 900 litre tank collecting water off our large shed roof, set up so I can easily attach a hose and draw off the water when I need it. And the water from the small shed’s roof is being directed into the pond, so that, hopefully we won’t need to refill it with water from the well when summer evaporation threatens to dry it up. Any overflow will water the garden around the pond. There is still a lot of water we don’t capture, but the rain off the house roof currently runs out into perennial garden areas, including some of our fruit trees, so it’s reasonably well used. Waste not, want not. At least, we hope so.